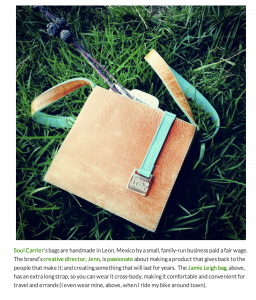 Congratulations to our Client Soul Carrier for their feature, as an ethical holiday gift, onÂ Eco-Chick! Soul Carrierâ€”artist Jennifer Paigeâ€™s company of inspiring handbag lines, was born out of a combination of artistic passion, soul searching and determination.Â While working through and overcoming personal tragedy, artist and designer Jennifer Paige took a leap.Â Determined to create positive out of personal grief and struggle, she created a brand of unique handbag lines inspired by the amazing people in her life and a deep connection to the soul. Designing for the carefree, conscious and motivated modern woman, Soul Carrier makes a statement of inner strength, beauty and peace while coordinating perfectly with those favorite ripped designer jeans and funky sunglasses. Check them out at soulcarrier.com!